A few years ago, there were two brothers in Britain who appeared in court because they had allowed their dog to get fat. “Rusty”, a Labrador, had ballooned to over eleven stone because he had been over-fed and under-exercised. The brothers had been warned, and told to seek veterinary advice, but Rusty had continued to be hugely and grossly overweight. Eventually, the RSPCA had confiscated the dog, and proceeded with prosecuting his owners for cruelty. Less than a year later, Rusty had lost four stone in the care of the RSPCA, and he is living a much healthier and happier lifestyle. 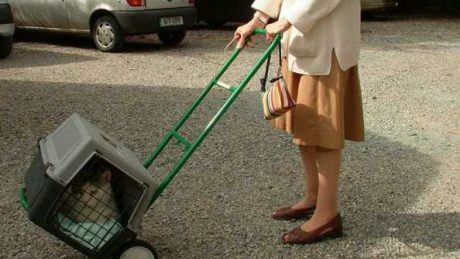 Pet obesity is as widespread in Ireland as it is in the UK, with excessive weight causing problems for many animals. Most often, the problem is simple. Owners simply feed their dogs too much food, and do not take them for enough exercise. The answer to the problem is to give less food and more exercise. Special low-calorie diets for pets make it easier for weight to be lost in a controlled, manageable way. However, if you ever read advice for owners of fat dogs, you will see that the first recommendation is usually “get your pet checked over by a vet”. There are some medical problems that can cause pets to become obese, and in such cases, there is no point in just putting the dog on a diet. These animals require medical treatment for their obesity, and nothing else will work. Alfie had been a slim, trim, active little dog who loved going for walks. Last summer, for no obvious reason, his personality seemed to change. He started to lie around the home more than before, sleeping instead of being active and energetic. When Nathan took out the dog lead and headed for the door, Alfie just lay there, barely lifting his head. He had to be almost physically dragged outside to go for a walk. When he was on walks, he just moped along, with none of his usual bounciness and excitability. At the same time, Alfie was showing no obvious signs of illness. He was just a slower, sleepier dog than before. It was as if he had matured from an energy-filled adolescent into a sedate but healthy adult dog. Over the following few months, Alfie began to gain weight. Nathan had been giving him less food than before, to compensate for his lack of exercise, but despite this, Alfie was getting fat. He had ballooned from just over two stone to almost three stone in weight. At this stage, he started to develop another problem. He lost his bright, healthy, thick coat, and a large bald patch of skin developed along his back. Nathan realised now that there was something very odd going on with Alfie, so he brought him in to see me. When I checked Alfie over, the first thing I noticed was that he was very cold to touch. When I put my hand on the bald area on his back, it was as if he had been in a fridge. I took his temperature with a thermometer, and it was sub-normal. As I continued my examination, I discovered that his heart rate had slowed down significantly, and just more than one beat per second. Little dogs like Alfie normally have two or three heartbeats every second. Alfie was showing classical signs of a disease called hypothyroidism, commonly known as an underactive thyroid gland. For some unknown reason, the thyroid gland sometimes stops producing the thyroid hormones which keep the body whizzing along at its normal healthy rate. If these hormones are absent, it is as if the foot has been taken off the accelerator pedal of the body’s metabolism. Everything slows down, including heart rate, body temperature, hair growth and enthusiasm for exercise. I took a blood sample from Alfie, and the test results confirmed the diagnosis. He was immediately put onto a thyroid supplement, and when I checked him three weeks later, he was like a different dog. His energy had returned, and he was loving his walks again. His fur was beginning to regrow on the bald patch, his heart rate had speeded up, and his body temperature had returned to normal. And despite no change to his daily diet, he had already lost ten per cent of his body weight. 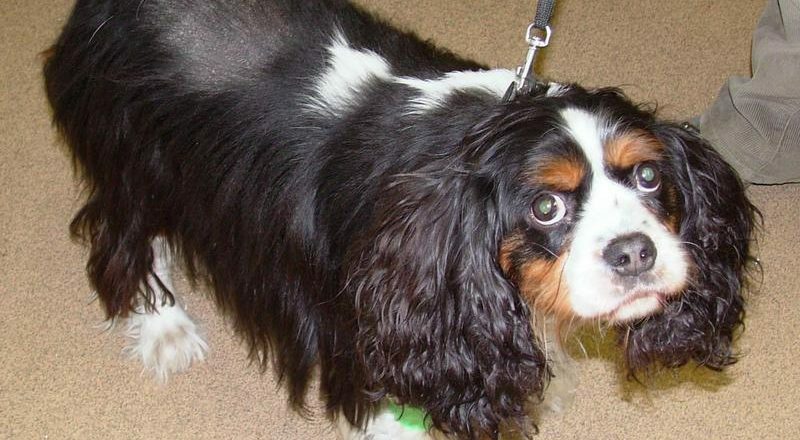 Alfie will soon be completely back to full health, but he will need to stay on the tablets for the rest of his life. Medical causes of obesity are rare, but when they are diagnosed, they can often be easily treated. 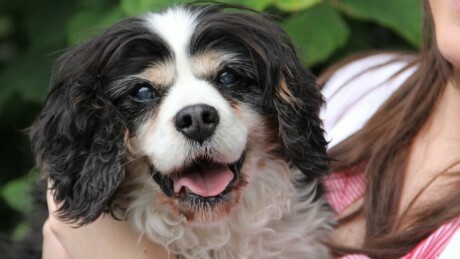 Josh, a 15 year old Cavalier King Charles Spaniel who has liver cancer.